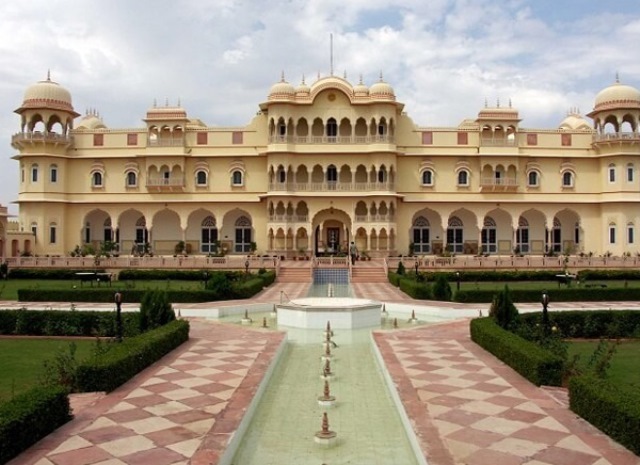 Nahargarh Fort is built on a part of the famed Aravalli Range of the region, which also happen to ring the popular Man Sagar Lake (the lake where one may find the Jal Mahal or Water Palace, another tourist attraction). This perch provides those dwelling in it the luxury of a truly imperious view of Jaipur, which spreads below, to the south of the fort, like a sea of pink waters (the city is not called the Pink City for no reason). At night, this sea turns into a fallen sky, shot with the pinprick lights of thousands of streetlamps and homes. Viewed from Jaipur, the fort is equally magnificent, a lonely but majestic stronghold that once housed the royal family during their hunting excursions as well as the British officers and their families during a mutiny. This sort of romantic presentation must surely have a romantic story behind it, and that is definitely true of the Nahargarh Fort. Legend has it that it actually takes its name not merely from the typical royal desire to project a fearsome and majestic impression with the site’s name but also from a prince who had passed away, Nahar Singh Bhomia. The prince’s spirit was said to have haunted the location terribly during the construction, and apparently interrupted building efforts to constantly that the builders could not continue with the plans. Finally, a communication was made by the spirit that it would vacate the location and let construction go unhindered should one condition be met: it demanded that the fort be named after him. Thus, go the stories, Sudarsangarh became Nahargarh. One of the most interesting properties of the fort is in one of the palaces within it: the Madhavendra Bhawan. This palace has possession of no fewer than a dozen royal suites that have the same design and splendour down to the carvings on the walls. These rooms are said to have been ordered built by the Maharajah Sawai Madho Singh, and they were originally intended for the ladies of the royal family, specifically the maharanis. The Madhavendra Bhawan was used as a summer palace by the Kachwaha Rajputs of the city, and its glorious trimmings and frescoes are certainly splendid enough to merit royalty living in it. Nowadays, Nahargarh Fort is typically visited by tourists and travellers eager to get a picture of mediaeval Indian styling in military as well as royal architecture. The fort is open at the usual times for most tourist sites: 10:00 hrs to 17:30 hrs. There is typically an admission fee collected of visitors, and as with other tourist attractions open to the public, foreigners have to pay more.